Du durchsuchst gerade das Archiv des Tags ‘Richard Thompson’. „Few things are certain in life. Birth, death, your favourite football team will let you down at some point, etc, etc. Oh, and the fact that when Mr Reliable releases an album, you’re guaranteed a piece of class.“ In regards to 13 Rivers at least, I think, the writer is right. Of course, Richard Thompson is a living legend, remember his days with the folk-rock pioneers of Fairport Convention, his duo albums with former partner of ancient times, Linda, and, well, his compassion for music, documented on many, many solo albums. But somehow I lost track of him. Even the classic Liege a Leaf that had blown me as a teenager with its raw and romantic landscapes (the long far away and gone) later sounded strangely dated, like a spell losing its magic. I had my hours with the likes of Fairport Convention, Pentangle, and even the more trad-oriented Steeleye Span. But, then, the times are gonna, yes, you know. So, this is no statement of a merciless critic, just an observation of changing listening habits. 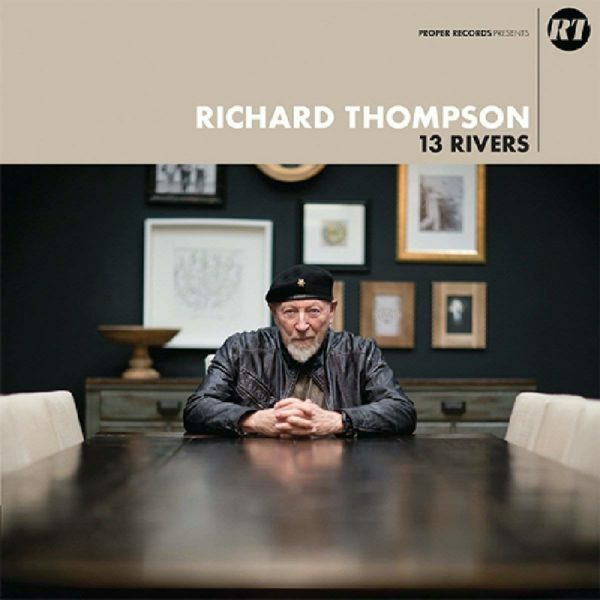 Then again, I was kind of surprised when his new work, 13 Rivers caught me on the right ear (if this phrase makes any sense), and I liked the songs of a power trio (el-g, b, dr) plus second electric guitar. From start to end. Rather dark stuff, self-produced in ten days. The songs, haha, even surprised the man himself. Didn‘t know, btw, he‘s a muslim, till I recently read an interview. Interesting. So, I even didn‘t care much when his voice on the first track sounded very much like Nick Cave. Old man going wild, with some surprising nods to his Fairport days. Reason enough to travel back soon to my first record collection (all in the basement, the back of my mind) where Liege a Leaf found itself in good neighorhood, with Aftermath, Atom Heart Mother, The Beatles – and the first Caravan album.